Cross-posted from SBLA sister site Santa Monica Next. A popular segment of the new Exposition Bike path will close for three months for maintenance. This long-term temporary closure provides an opportunity for Los Angeles City Councilmember Mike Bonin to pursue an easy win for safe streets in his Santa Monica-adjacent district, where recent safe streets implementations have met substantial opposition. 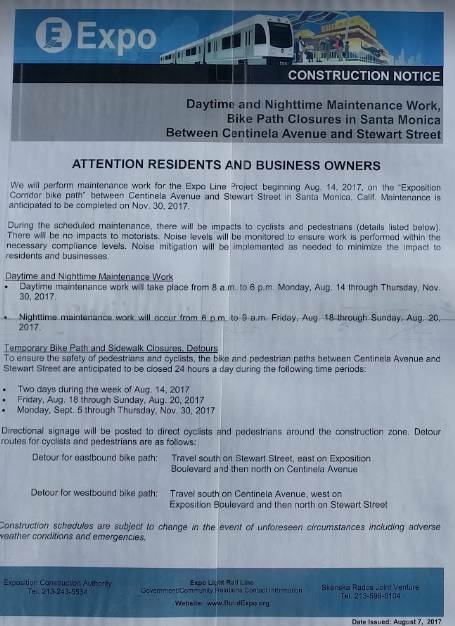 The bike path will close between Centinela Avenue on the border of Los Angeles and Santa Monica and Stewart Street in Santa Monica. 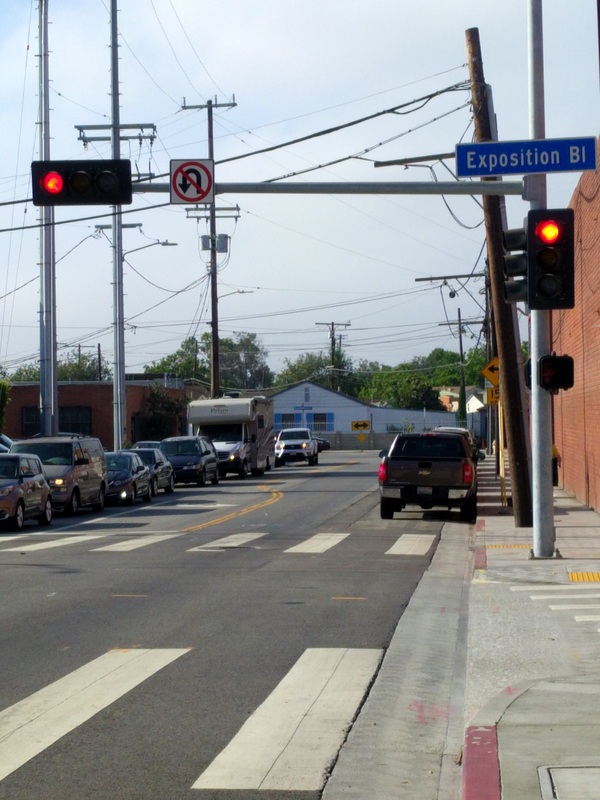 The prescribed detour puts cyclists on a 300-foot, heavily-trafficked segment of Centinela before continuing a half mile down a lightly-trafficked residential segment of Exposition Blvd and another 300 feet on Stewart Street. For people riding along this detour, sharing even this short segment of Centinela will be harrowing, given the speed and volume of traffic. Centinela forms the western border of Santa Monica and Los Angeles. On this block the entire right-of-way, including the west sidewalk, is located in the city of Los Angeles. Los Angeles permits people to ride bikes on the sidewalk, but a narrow sidewalk width and traffic and utility poles make a high volume of sidewalk riding unsafe. The Centinela segment has two through lanes and parking on both sides. The parking lane on west side of Centinela could be used for a temporary two-way cycletrack with delineators to create a safer, cyclist-exclusive right-of-way. 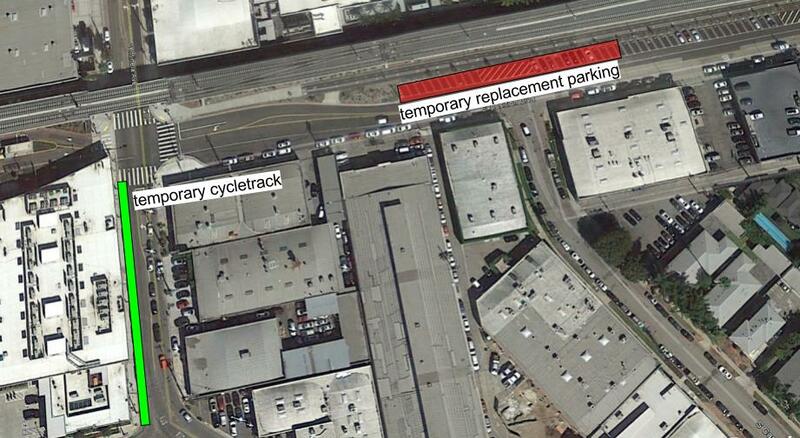 Because the Centinela segment is adjacent to a portion of the low-utilization parking lot for the Expo/Bundy station, street parking can easily re-accommodated by re-purposing about a dozen parking spaces during the closure. That there’s a temporary opportunity to improve cyclist safety without losing vehicle lanes or parking is an easy win for Councilmember Mike Bonin’s office, which has been beleaguered by opposition to street safety improvements in Mar Vista and Playa del Rey. It might not take more than a couple phone calls: Bonin’s transportation deputy, Paul Backstrom, is chair of the Expo Authority, which is overseeing the Expo bike path maintenance, and Bonin sits on the Metro Board, which controls the replacement parking. The relatively sudden three month closure raises questions about outreach and process from the Exposition Construction Authority, which is winding down. That group’s board has not met since April 2017. As of August 13, there were no construction notices on the Authority’s website. The path appears to be in relatively good shape through this segment, which has not been plagued by the same problems that has led to several closures for maintenance along the segment between Stewart and 26th Street. Given the abruptness of the closure, we owe it to give those who use the path — whether its for their commute, exercise, or family outings — a safe and comfortable alternative, especially when we can do so as easily as we can along this short segment of Centinela. The construction notice is addressed to residents and business owners. It’s unclear if any outreach targeted cyclists or pedestrians. 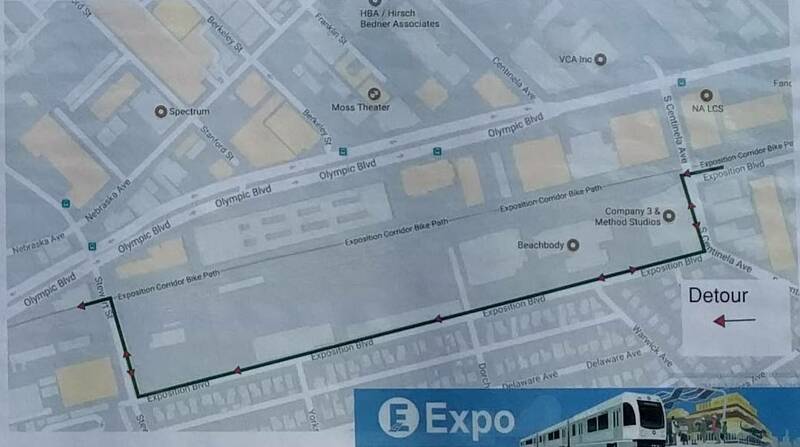 City Has a Plan for Expo Bike Path, But What About Complete Streets?